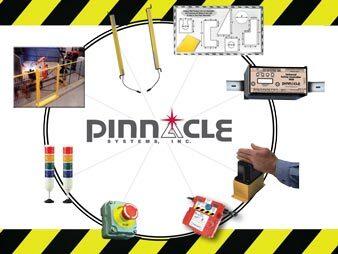 STTS | Safety Mat Systems | Pinnacle Systems Inc. The STTS (Soft Tactile Transducer Sensor) Safety Mat System is a technological paradigm in the field of presence-contact sensing/pressure sensitive safety mat systems. This revolutionary mat system is a hybrid design that combines features to meet and surpass both domestic and international safety standards. Through its advanced technology and state-of-the-art design features, the STTS Safety Mat System sets a new World Class Standard for the mat detection industry. The STTS system is a tactile sensor that provides information regarding the distribution and magnitude of tactile force applied to its surface. This patented technology involves the continuous and variable measuring of tactile forces of pressure. In some respects, tactile sensing for electro-mechanical devices is analogous to the human sense of touch–information about the amount and distribution of tactile pressure over a surface can be received and transmitted. When an object comes in contact with the sensor, tactile sensing provides information about the object’s shape, texture, position, orientation, deformation, center of mass, and presence of torque or slippage. If you have special needs or applications for uses of the technology, please contact the factory for our intelligent products. All STTS mats are homerun wired back to the safety relay controller and are continuously pulsed. This verifies that each safety mat is wired properly and is connected to the mat controller. Unlike open switch steel mat systems, the STTS controller pulses and monitors the safety system. This verifies that the mat wiring has not been bypassed, jumpered or shorted outside of the control box and prevents against an automatic reset of the control (green) with an unsafe condition present. 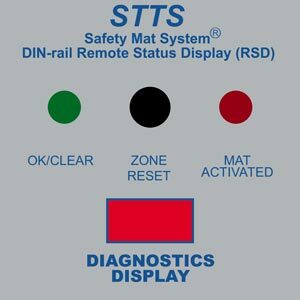 Each STTS mat in the safety system has a specific value and address that must be recognized and verified as the STTS controller monitors the safety zone. The STTS continuous pulsed monitoring system provides a higher level of safety mat guarding. This pulsed system eliminates the possibility of wire tampering or jumpering out of safety mats vs. open switch non-pulsed systems. Uniform Activation. This feature provides a uniform activation threshold (on/off signal) throughout the entire mat surface area. Our unique design of uniform activation also provides a guarding system that contains no dead zones. This provides the user with a much safer guarding system as well as compliance with domestic and international standards. No Dead Zones. Uniform activation means that the “STTS SAFETY MAT SYSTEM” has no dead zones on the mat surface–it is 100% ACTIVE. Other mats that use double-backed foam tape, O-rings, or large perimeter sealing techniques for element encasement create a dead zone around the entire perimeter of the product. Dead zones are also found directly above and below the many silicone spacers, elastomers, or insulators used as standoffs within the element assembly of force style mats. With the advent of specific safety mat positioning and layout formulas based on international safety standards, the “STTS SAFETY MAT SYSTEM” gives you the peace of mind of a mat detection system with no dead zones. Intelligent Matting. An “Intelligent Mat” is the same as the standard STTS safety mat–with the addition of a pressure-activated, “on/off” analog-controlled switch sensor, for areas based on force/area (psi). An “Intelligent Mat” provides a broad understanding of the kind of tactile event that is occurring and, in the same way as the standard mat, is scalable because of its analog output and natural psi characteristics. What makes the “Intelligent Mat” unique is that it can be programmed by varying the electrode pattern to determine where the contact has occurred on a multiple position basis (in width “x” and length “y”), and the basis of mass point loading (“z”). This solves cumbersome multiple mat installation problems normally associated with mats. It also eliminates the need for thresholds, close-out and uniting strips that create dead zones, which increase substantially both product costs and installation time. Customized Safety Mat Inlays. The “STTS SAFETY MAT SYSTEM” is an excellent method for guarding machine areas such as the back of press brakes, assembly machinery access areas, deck runways, robotic areas, etc. In addition, the “STTS SAFETY MAT SYSTEM” can be custom fabricated to provide an exact fit for those hard-to-guard areas–often with only one mat. It is also excellent for OEM applications. Presence Contact Sensing/Pressure Sensing/Pressure Sensitive Mat System. By providing greater sensitivity and uniform activation, the “STTS SAFETY MAT SYSTEM” is in a class by itself. This true and uniform activation threshold is unobtainable with competitive “force-style” mats. Competitive mats normally utilize insulators within their switching element as standoffs and around their perimeters as seals. These standoffs or insulators create dead zones and require large amounts of force to activate the mat. Integrated Modular Design. Because of our unique manufacturing techniques and product versatility, we are able to design a modular system specifically for your project. This means you can safely guard the toughest of applications in an efficient and cost-effective manner. Our experienced factory personnel will make sure detailed system layouts are completed with safety and cost-effectiveness in mind. All aspects of the project are reviewed including layout, shipping, and installation. Safety is always paramount to the project “system design” scope. Single Mat Capacity. Save time and installation costs with single piece mat installations. Help eliminate or reduce daisy chain wiring practices required by competitive systems. The sizes shown are typical single piece mat installations that illustrate the manufacturing versatility of the STTS Safety Mat System. The wiring exit positions can be located anywhere on the mat perimeter. 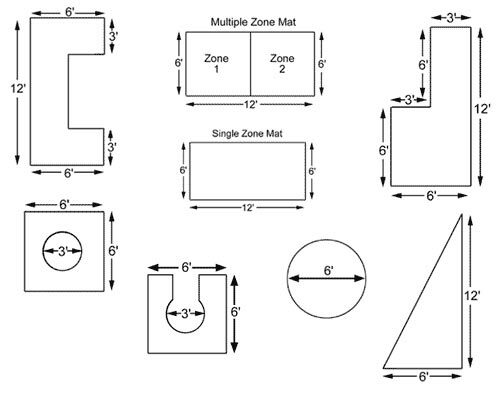 The mat sizes shown can easily be altered to fulfill your specific project needs. No tooling fees for special mat designs.